Just got back from the Shadbolt Clay Conference in Burnaby, British Columbia. It's a 3 1/2 hour drive from home, but well worth the trip. It was a great conference. Small, but quality offerings in the way of demonstrations and information. The highlight for me was to meet Magdelene Odundo whose hand coiled, burnished pots I've seen in museums and admired for their beauty. We were able to chat for some time about her work, the UK, and travel. What a wonderful thing--to be able to meet one of the giants of the ceramic world in such an easy atmosphere. The problem with these conferences and conventions though, is deciding where to spend your time. There is so much stuff going on and so many things that you want to see and do. Too bad you can't clone yourself just for a short time and go everywhere. Choices, Choices! I decided to get out of my comfort zone and go to demos that were about techniques I know very little about. I was a total sponge in Kinichi Shegeno's newspaper resist demonstration. He not only worked live, but had a video explaining the technique. He also did a slip mold of a very large teapot form and threw a giant platter. So generous with his information and full of great tips. The only disappointment I had was he ran out of time and didn't address overglazes. I then went to a demonstration by Jeannie Mah of transferring printer images onto procelain. An extremely interesting process, I decided that I loved the idea and can adapt it to drawing my own images, running them through a printer and transfer it to a porcelain surface. Can't wait to try it! She is truly a master of this process. 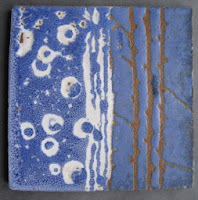 The final session was with Diane Creber who does crystaline glazes and has written a great book on the subject. I chose to go to this one because these glazes both attract and repel me. The ones I like, I really like; the ones I don't I really can't stand! Diane works in small crystal formation. The process is very involved and regimented, it seems to me with much technical ability both in formulation and firing control to produce the growth of crystals in the glaze. Diane's pieces were stunning. Especially a totally new matt kind of result. Sorry, my pictures didn't turn out for an example. 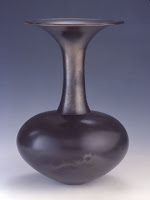 Anyway, I resolved that should I decide to tackle these kinds of glazes, her book will be the perfect guide. And speaking of books, I was asked to autograph one myself. I was standing at one of the commerical booths and a lady was buying "500 Teapots". I pointed to the teapot on the back cover and said, "That's my work." She was flabergasted. I said that I had three selections in the book and she asked me to sign the back cover. Beside the talks and demos, there was a gallery show of participant's pieces and/or any interesting piece owned by anyone who wanted to display it and write a small blurb on the placecard that went with it. I took the white teapot that is at the beginning of the blog and a mug to donate for the sale. There was one corner in the gallery area that displayed donated mugs and sold them on the spot. They were selling just about as quickly as they were being put on the wall. It's nearing the end of March and it seems as though I'm walking through mud. 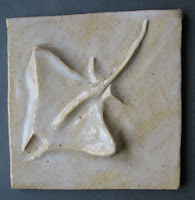 Other things have eaten up my studio time---mostly the need to attend to the "Everyday". When you must concentrate on "Everyday", it steals your time and your mind from creative dreaming....... Sometimes I jot down notes to myself. Something will trigger a new idea. 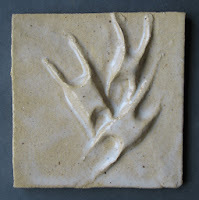 Like "Think about pots that have sculpted feather forms for handles." Or I'll make a sketch of a new idea for a jar and lid form. I have to do this immediately because it is as if I have two minds: The Studio Mind and the Everyday Mind. When I'm in my studio, nothing else exists. I pick up right where I left off and continue to work on whatever I left there in progress. Forget House, Errands, Dinner, What-I-Need-To-Do....Time dissolves. When I'm away from the studio and a fleeting idea comes, I must make some kind of note or it will be gone; swamped by the Everyday. Saw "300" in IMAX format this weekend. What can I say? It's a visually stunning movie. The CGI is incredible, undetectable and married with the action so well it is hard to believe that everything beyond about 30 feet from the actors is made by computer. Having been a lover of ancient history and having grown up in a home that was full of books on art and sculpture plus a full set of Ridpath's History of the World with it's beautiful engravings, the film to me was like watching pieces of art come to life. The true story of the bravery of the Greek 300 standing off Xerxe's massive army is one I've know since childhood. There are moments when the film packs a visual whammy of imagery that prints in your mind. The action is seamless, the acting extremely strong and convincing. Gerry Butler takes command and keeps it. The accompanying book "The Art of the Film" is a great behind the scenes look at all the components that go into making a film like this. Amazing that months of work and skill boil down to one or two (hopefully more) weeks in theaters! It's been a long time since I made tiles; just tiles. 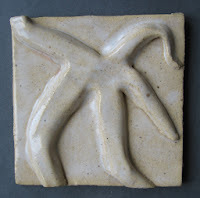 Sometimes I make a 'set tile' for a teapot and cups to rest on, and even though I have been working on a bathroom shower installation with a sweep of handmade tiles across the wall, I have not made many tiles lately. I saw a notice that Lark Publications will be doing a "500 Tiles" book and spent the afternoon photographing some rather old ones in prep to send the digitals for jurying. This is a "Sea Life" series I did about 8 years ago. 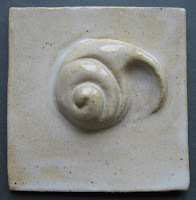 They are 6 inch tiles rolled to 1/4 inch thick, then the forms are sculpted on top of the tile, glazed in a basic white glaze and fired to cone 6. I'm a little baffled about how to upload the digitals to a website using ftp, but hopefully will have that figured out before the weekend. Update: I finally got the files sent to the publisher late Sunday, but not before lots of head scratching, cursing, reading tech pages and asking several different discussion lists for help. Yeah! Once again the forces of good conquer the evil computer!